I am on a bend, trying to learn more about nutrition and healthy fats in particular. I am seriously trying to learn more about the role of fat in my diet. There is a lot to it. For most of my life, I lumped all of the different kinds of fat together — things like belly fat, saturated fat, and Omega-3 fats. Most of my eating plans would revolve around calorie counting. I have a better handle on it now, but I’m still learning about nutrition, macros (protein, carbohydrates and fat) and how to be more healthy as I work on maintaining my weight loss. Note: I am not a dietitian or nutritionist, just someone trying to sort it all out. Today is the Saturday after Thanksgiving. Although it has been about 12 years since I gave up baking hundreds of Christmas cookies, that I would allegedly give away to friends and family or to have available if someone dropped by, I still remember pulling cans of Crisco shortening, sticks of butter and bags of sugar in preparation for this baking tradition. Now, I have replaced this activity by pulling out the lights and putting Santa decorations on the mantle instead! I guess my lack of knowledge had me just figuring that anything with a lot of fat in it would probably make me fat. I didn’t actually know that there were so many types of fats. Of course, I’m still learning. 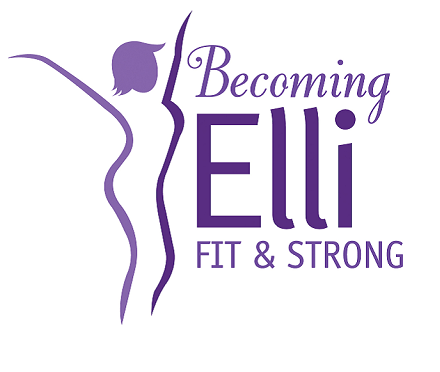 Jill and I named this Becoming Elli because we are still learning and working at it. However, now my cupboard is stocked with a big can of Extra Virgin Olive Oil, a jar of coconut oil and stack of sardine cans. I haven’t bought corn oil for a very long time. Crisco is a distant memory. It wasn’t until about 10 years ago that I bought my first avocado. Now during my visits to the grocery store, I’m always giving the avocados the squeeze test to find the best ripe, but not too ripe, ones. I’ve really developed a taste for sardines too. I have learned that there are a lot of good reasons to add healthy fats into my food plan. I’d rather eat my healthy fats than take a pill. Taking a gel tab from my big jar of fish oil gel tablets tend to make me burp. Perhaps you already know these facts about fat. I’m probably late to the party. It is still relatively new information to me, as I wasn’t brought up knowing this and have been learning it as I go. Low fat isn’t always a good thing. Lots of times something that is low fat has been changed to taste better by adding in lots of sugar. Too much sugar in your system ends up with extra fat being stored because it cannot be processed. Your body processes sugar first, then fat. But it won’t get to the fat if there is too much sugar. Some fats help to regulate hormones which helps regulate body weight. I think the hormone is called leptin but there is still some mystery around how that all works. Healthy fats protect you against some diseases – diabetes, cancer, heart disease. The word fat is a bit deceiving to me. I know that I don’t want to be fat, or at least I don’t want to have too much body fat. The word fat is used different ways and not always for describing the same thing. Fat, floating on a soup or the top of a gravy, is pretty unappealing. Fat hanging over my blue jeans isn’t good either, but healthy fats keep you thinking, satiated and protect against some diseases. I know I can’t trust my taste buds anymore. “It tastes too good to be healthy.” That’s not always true either. I love the taste of avocado. Things that taste delicious are sometimes very good for health and that is the case with avocados for sure. Like most things, in many cases healthy fats are a matter of degree. Eggs, a wonderful source of fat and protein that I consider a staple, used to be considered a potential cholesterol-raising food. We’ve now had the all-clear on eating eggs. Apparently cholesterol in our bodies does not really come from the cholesterol in our food. I have 11 chickens laying eggs, so you know how I feel about eggs! Omega3 fats are important for us to eat and most of us don’t get nearly enough of them to eat. That’s why I have sardines to my diet. 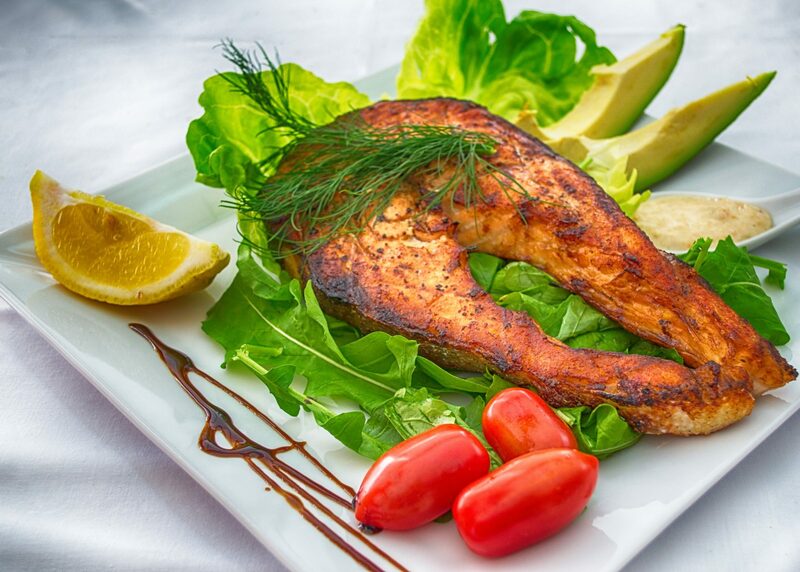 Oily fish like salmon and sardines are great sources of omega 3 fats. I’ve heard people argue about coconut oil, which turns to a solid under 76 degrees. Some say that cooking with coconut oil when using higher temperatures is the way to go. Others say that coconut oil has the most saturated fat of any fat. People are arguing over saturated fat now. Some say we need it; others still insist it’s bad for you. Here’s the reason people like to use coconut oil. Some of the fats in it are what’s called medium chain triglycerides. These types of fat go straight to the liver and are used for energy rather than being converted into body fat. You’ll have to make up your own mind about coconut oil because many of the food experts advice against using it, while many others recommend it. Of course, there have been much discussion about the virtues of dark chocolate. I gather the darker the chocolate, the less sugar and the better it is for you. I’ve seen recommendations for dark chocolate with at least 70% cocoa and others as high as 85%. 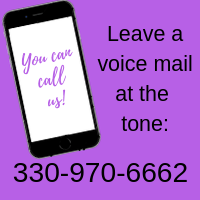 The darker the chocolate, the less sweet it is but if you give yourself some time, you’ll get used to it and really think of dark chocolate as a treat. I am still skeptical about “smart balance” and “healthy choice” brands. While many foods are under discussion, I think we can all agree that trans fats are bad. Trans fats were found in fried foods, fast food and certain baked goods… or at least they used to be. Trans fats raised the bad cholesterol and lowered the good cholesterol. In 2015, the US government passed a ban on all trans fats, which had 3 years to take effect (June 15, 2018, almost 6 months ago!) So, in theory, they are gone. Trans fats (partially hydrogenated fats) had a very weird chemical bond. It is where hydrogen was during a manufacturing process to make a liquid oil into a solid. It can still be confusing about which are healthy fats and which are not. Saturated and unsaturated fats are on the spectrum, with saturated fats being on the bad side, and unsaturated fats on the better side. I figured I could just go to a chart (put out by the USA government) and it would be clear to me which fats are the right ones. Ha ha! Not so fast! Courtesy page 26 of the PDF on the Health.GOV website. Click for full 144 page report. 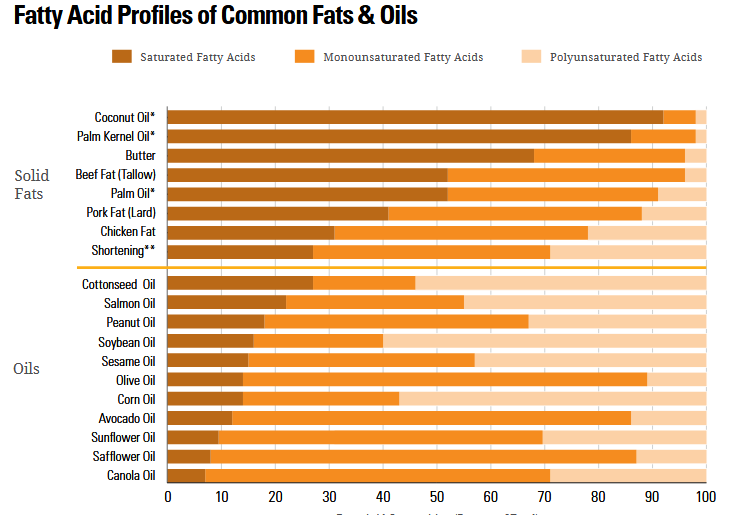 See the chart about common fats and oils shown on page 26 of this 2015-2020 PDF from the US government. What is the difference? (Here is where my eyes start to get glazed over, as the memories of high school chemistry class come back.) It has to do with the bonds, double bonds versus single bonds and if it has been manufactured. I’ll spare you the diagrams. Saturated fat are usually a solid at room temperature… in general saturated fat is a solid or a liquid, depending on the temperature. like butter, cheese and animal fats. Some, if not many, people think saturated fat is linked to heart disease and high cholesterol. Saturated fat is “packed tighter” than unsaturated fat. Others say we should avoid most vegetable oils except for a few oils like olive oil and avocado oil. They recommend using butter, coconut oil, and other oils high in saturated fat. Not to be wishy-washy, but this can become a bit confusing. So now, leave a message below with your take on the healthy fats. Which do you eat? Which do you avoid? Do you disagree with my take on the situation? Time for me to go decorate the mantle and put on some Christmas music.